In our online store you will find an eccentric mixture of exclusive and high-value fabrics for your projects. 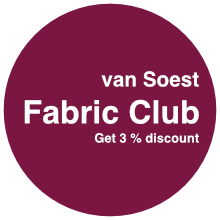 In van Soest’s fabric store you find heavy and light fabrics for your evening wear and party wardrobe, many variations in silk, lace, sequins, high class chiffons, jersey, knitted fabrics as well as TENCEL®, Cupro®, Rolva® and Modal® fabrics, Fashion fabrics with exclusive patterns and much more. "Kleider machen Leute, und Stoffe machen Kleider" Is a well known German proverb. Most of the fabrics, that we use, we wear on our body and there top quality is requested: in the first place the fabrics should be comfortable, feel well and have a good drape. Fabrics are our profession since over 40 years. We know the worldwide fabric markets and select only the best products for you from high value producers and traders. 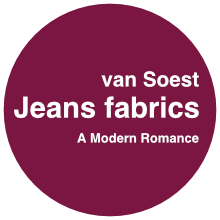 Specialists, like producers of high quality laces, sequins, TENCEL®, Cupro and Rolva fabrics are well-known by us since many years and deliver to us regularly. Our with great care selected fabrics wil give you satisfaction and covers fabrics for all tasts and budgets. We follow the new rules for sustainable and biogradable products SBP. If you are looking for a special article - we help you try to find it for you without fail. We cannot achieve all, but a lot and we do it for YOU - our respected customer! OUR SERVICE - WE SELL ALL OVER EUROPE. Looking for flowing fabrics for your evening and party wear, you will find it with us. Our customers are individuals, theaters, orchestras, singers and all who are looking for special and eccentric sold by the meter fabrics for custumes and special designs. Designers, small enterprises and studios know where to find our value for money fabrics to produce their own garments or sell the results to exclusive customers. If you need advice, our team is since many years in the design and production of high class garments and is ready to help you or give professional advice. Test us please. Retail as well as wholesale. Your opinion is important to us. Please give us your feedback!